The plastic two 2 wheeled waste recycling bins comply with the European standard EN 840 and are tested according to the criteria of RAL GZ 951/1. 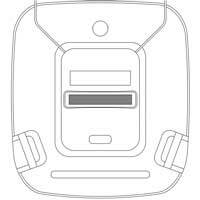 In addition, the wheeled dustbins are marked with the GS symbol, the appropriate decibel level and the CE mark. The sturdy lid of the mobile garbage bins are equipped with two handles and is manufactured from specially developed high-density plastic. It is designed for simple exchange, for example, if the waste fraction changes. 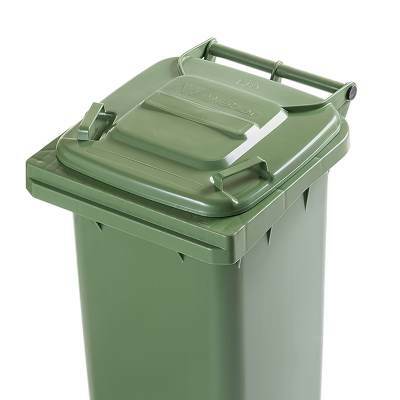 The lids of the two 2 wheeled recycling bins can be supplied in brown, blue, yellow or green, regardless of the body colour. The handles of the wheeled recycling bins also serve as the fixing points for the lids, which are attached to the handles with two hinge pins. The handle of the two 2 wheeled trash/garbage can is designed to facilitate secure handling when wearing winter or work gloves. 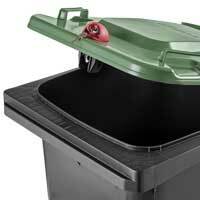 The mobile two 2 wheeled waste wheelie bins feature a hollow base to reduce volume. The design of the support structure, reinforced with ribs, ensures a low centre of gravity and improved support for the base. In addition, the two external quiet-running wheels ensure great stability of the trade waste recycling bins, even when fully loaded. 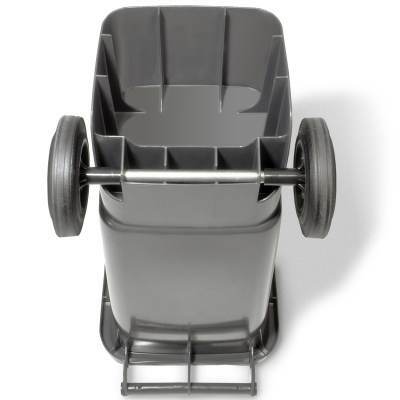 The two 2 wheeled mobile recycling containers are equipped with two sturdy solid rubber wheels (200 mm diameter). 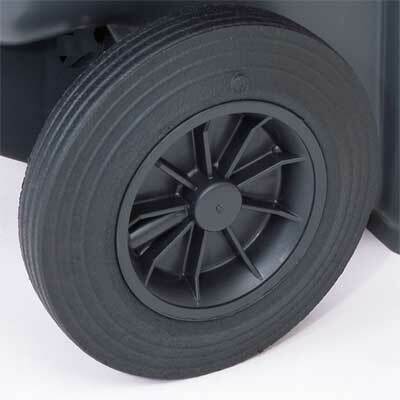 An integrated spring-loaded pin fastens the wheel securely onto the axle of the wheeled dustbins. 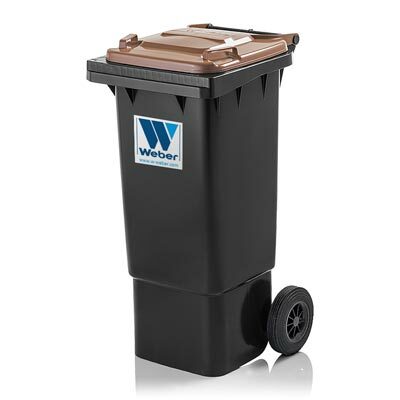 Waste recycling bins 80 l from Weber are ideal for general waste, organic waste, packaging etc. Learn more about our 2 wheeled bins! “Please do not put in hot ashes”, your company name or name of the city. 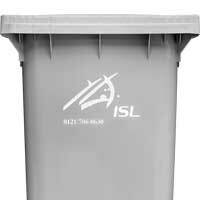 Many options are available for permanently marking the lid of your wheeled refuse bin with injection-embossing, for example, “NO HOT ASHES”, your company name, name of city/municipality. We would be pleased to offer our advice. 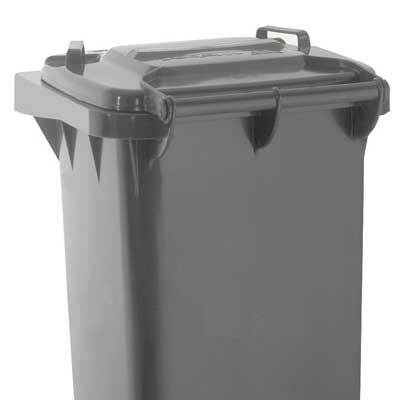 The body of the wheeled refuse bins can be permanent hot-foil printed in a single colour. For example, you may customise the mobile two 2 wheeled trade waste recycling bins with your company logo, lettering or information such as “Organic waste only please”. 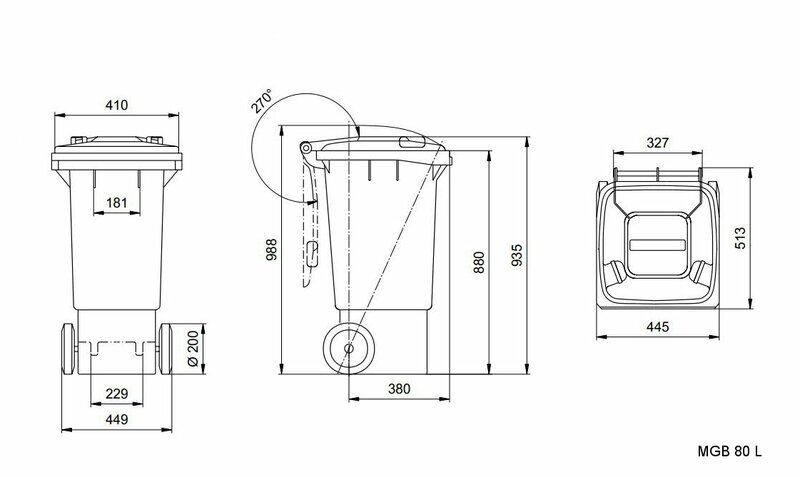 Our plastic trash/garbage cans have a chipnest according to DIN 30745 and RAL GZ 951/1 to accommodate RFID chips/transponders. 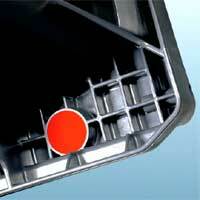 The data carriers can be inserted directly at the factory into the comb-lift of the mobile wheeled refuse bins. Prevent the unauthorised use of your two 2 wheeled mobile recycling containers by equipping it with a locking system. Manual or automatic locking systems (gravity locks) can be installed with triangular or profile cylinder lock.